Wands have been used in many cultures throughout history. Probably the most famous of all are the Celtic wands in the time of Merlin. Wands and other vibrational tools were also used extensively in Lemurian, and Atlantean cultures and much information has come down to modern times regarding these implements. We also have many of the cultures of Africa, Asia, and Europe using these implements for healing or other uses. We still see this legacy today in positions of authority showing staffs, crooks, and sceptres wielded by church leaders and heads of state. Wands are also used prolifically throughout the Tarot decks, and this has kindled an interest in all forms of energy work, magic, healing modalities, Wicca, and shamanism. 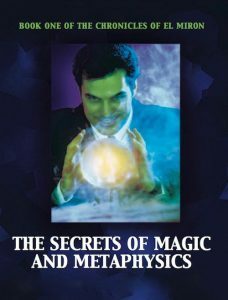 Most metaphysical practitioners like to create their own wands or ask a practitioner to make one for their personal use rather than purchase wands that have been commercially made. Wands can be made out of anything—wood or metal or other substances. Leather can be used in some wand designs to insulate the energy field of the practitioner from the wand, but this is not necessary if the practitioner knows how to use the wand. Shamanic wands can utilize leather and fur. Many traditional wands were and still are made from wood. 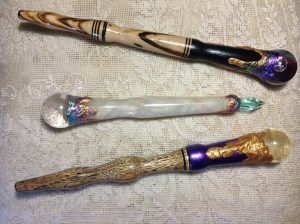 The wand can then be fashioned or carved into an appropriate form and augmented with the addition of crystals, or other items significant to you. Wooden wands are by their very nature ideal for practitioners of shamanism, earth magic, Druidism, Wicca, and so on. Generally speaking wooden wands have a very subtle, flowing natural feel to their energy. The wand was always a part of the Druidic and Shamanic tool kits; it was used to work with the element of air, which is associated with the mental body and the intellect, hence its use as a focus for one’s intent. But wands can be used with any element. It depends on the use of the wand and the intention of the practitioner. 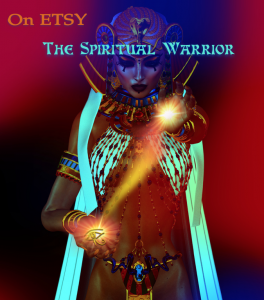 There are also the popular metal-based wands, and these are highly conductive and do focus the energy intensely when an experienced practitioner uses one for a specific purpose. Most designs include the use of additional wires or other material and some are encrusted with crystals and pearls. Metal wands are easy to make as copper, brass or stainless steels are easily obtained. The pipe is then cut to length, and the appropriate crystals inserted in the body of the wand. Once the ends are sealed with other large crystals, the wand is ready for use. Other decorations can include smaller crystals and pearls around the larger crystals at either end. Some wands use fluorite octahedrons on one end with a large, single terminator at the other end. It all depends on the primary use. Some wands are fashioned entirely from pure crystal. I use polished crystal wands or the large natural variety, both for removing negative energy or putting energy into a depleted area. All crystals will blend their vibrations with that of the wand in order to bring about positive change. One of my favourite wands has a large sphere at one end, which collects the energy I want to use so that I can channel it out the other end of the terminator. Other wands can be used like a sceptre, where the energy radiates out spherically to either cleanse or irradiate a working area. Wands are held in the power hand, which is usually the right hand. This is the projecting hand of the practitioner and helps to project the energy outside the body to the receiver of the energy, or to some other object. Most practitioners of metaphysics use wands for healing, magical practices, to draw sacred symbols, to give or receive energy, or for some other sacred purpose. Normally to pull out energy, the wand is directed to the area to be cleansed, and turned in and anti-clockwise fashion. To replace the energy with a higher frequency, the wand is turned clockwise. If you are working with angelic or Master energy, they will often assist in transmuting the negative energy. I normally open a session and call them in at the beginning, so I am open to guidance throughout the whole session. 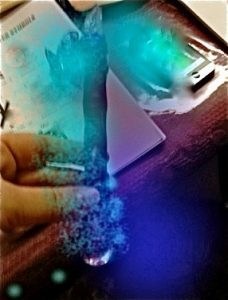 I always use St. Germain and his Violet Flame for transmuting the energy. If you tune into him, he will give you specific ways of using the Violet Flame. After the wand has been used, you can cleanse it using a smudge stick, or by using your own holy breath by blowing down the wand to remove any negativity. In addition to healing, cleansing and irradiating, wands may be used as an aid to meditation by holding the wand in position while in the meditative state. 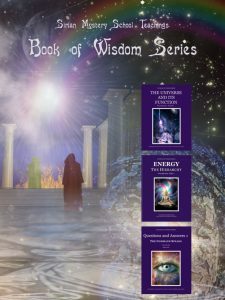 Your angels or Masters will give guidance on this technique as the wand is held in a very specific manner to achieve the awakening of certain areas in the body. Another thing that wands can be used for is dowsing; however, as this is very difficult to explain, (easy to implement, once you have the knack), I will leave you to draw your own conclusions. We must remember an important lesson of Kabbalah, and the Tree of Life, or the universe, each of us relates to as in a closed circuit of energy. There is no way to get rid of anything. Nothing ever goes away. Energy can be transformed or transmuted but it does not disappear. This is a point to remember when utilizing a wand for healing. NB. The picture at the top of the post is a wand after enchantment. A single terminator with a sphere on the other end. The picture below shows wands before enchantment. © 2019 College of Esoteric Education. All Rights Reserved.